Be the first to share your favorite memory, photo or story of Elmond. This memorial page is dedicated for family, friends and future generations to celebrate the life of their loved one. 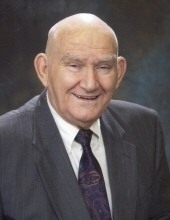 Elmond Eugene “Gene” Smith, 80, peacefully passed away on Thursday, March 28, 2019 at Kitty Askins Hospice Center surrounded by his family. Born in Wayne County on January 3, 1939 he was the son of the late Elmond Smith and Sallie Stafford Smith. Gene was a retired insurance adjuster and a veteran of the U.S. Air Force. He was a member of Rosewood First Baptist Church. Gene was an avid UNC fan and found joy in the simple pleasures of a Tar Heel win or almost equal: a loss by the Blue Devils. The family will receive friends on Sunday, March 31, 2019 from 2:00 – 3:00 p.m. at Seymour Funeral Home followed by a service to celebrate Gene’s life at 3:00 p.m. in the chapel with Dr. Mike Collier and Rev. Vernon Braswell officiating. Burial with military honors will follow at Evergreen Memorial Cemetery. Gene is survived by two daughters, Angela Barlow and husband, Scott of Midlothian, VA and Tammy Marie De Groft of Glen Allen, VA; son, Jeff Smith and wife, Eileen of Willow Spring; brother, Luby Smith and wife, Becky of Goldsboro; sister-in-law, Linda Smith; seven grandchildren, Jessica Emery and husband, Chase, Darren Barlow, Abigail Grace De Groft, Zane Jason De Groft, Jennifer Convey, Zachary Edward Eugene Smith, and Matthew Ryan Smith; and two great-grandchildren, Brandon and Noah Convey. In addition to his parents, he was preceded in death by a brother, Luther Smith. In lieu of flowers memorials may be sent to Rosewood First Baptist Church, 562 NC Hwy. 581 South, Goldsboro, NC 27530 or to Kitty Askins Hospice Center, 107 Handley Park Court, Goldsboro, NC 27534. Online condolences may be sent to www.seymourfuneralhome.com. To send flowers or a remembrance gift to the family of Elmond Eugene Smith, please visit our Tribute Store. "Email Address" would like to share the life celebration of Elmond Eugene Smith. Click on the "link" to go to share a favorite memory or leave a condolence message for the family.